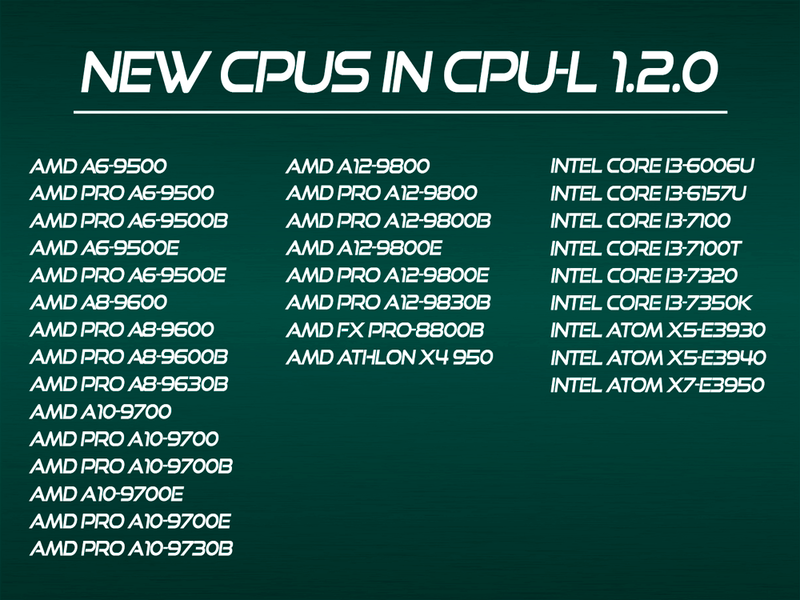 In the last update of CPU-L we have added more than 30 new CPUs and we have corrected the wrong data in the database of CPUs. We are in the first place with the new AMD APUs of 7ª Generation Bristol Ridge both the standard versions as the PRO versions directed to the professional market. We have a total of 21 new APUs belonging to the families A12, A10, A8 and A6, with versions for both desktop and laptop computers. Among the new features compared to the previous generation, we now have support for DDR4-2400 memories, HDMI 2.0 and the use of the new socket AM4, being the socket that will be compatible with the future AMD Zen CPUs. Second, among Intel CPUs, we have added the new Intel Core i3-6006U pertaining to the Skylake architecture for entry-level equipment, several Atom series x5 and x7 for embedded devices and several Intel Core i3 belonging to the new Kaby Lake microarchitecture that have not yet been released, highlighting the new Intel Core i3-7350K, being the first Core i3 with multiplier unlocked for affordable equipment.